We LOVE to hear how we can make SmarterQueue better for you. Here’s how to navigate our Feature Request board. The board can be accessed from the 'cog/gear' menu in the upper right-hand corner of the site. 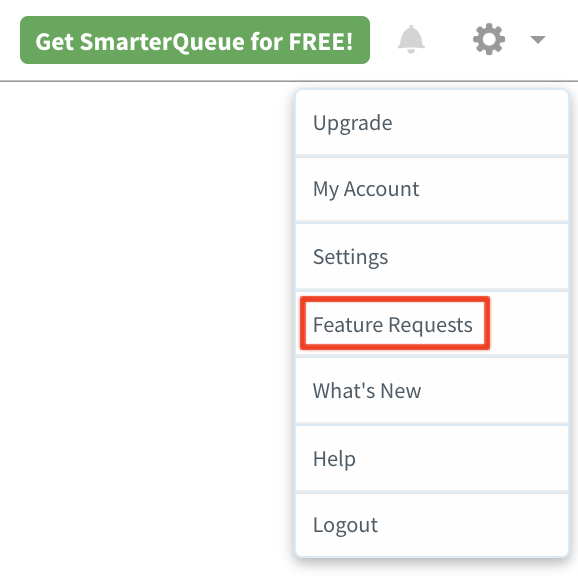 On the Feature Request board, you’ll see all the requests that our users have made for new SmarterQueue features. The entries that have the most votes are the ones we focus on first. Click the up arrow to place a vote for a specific feature. First, use the search box to make sure your request isn’t already on the board. We can’t accept requests that are duplicates of existing feature requests. If your request is new, click Request a Feature. In your request, make sure to be very detailed about what you’re looking for. Hit Submit when you’re done. The SmarterQueue team will be notified and may reach out for further information about your request. We’ll then check to make sure if we can accommodate your request. If your request makes it to the board, hopefully, other users will vote for it and we can get it built! Note: We appreciate all requests, however, not every Feature Request will be accepted and added to the board. If you have a comment on an existing entry, please click Comment on Feature Request to give us further details on how you envision this request working for you. It’s very helpful to learn how YOU use SmarterQueue and how we can make upcoming features work for you.